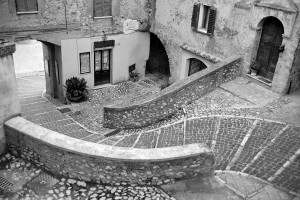 We’ll welcome you at the entrance of medieval village of Casperia after you reached it on your own or by train 50 minutes from downtown Rome. We’ll pick you up at the nearest railway station, only 10 minutes drive from the village. We’ll take you to Gusto al Borgo cooking school to enjoy your class and taste your meal as described in the “Experience” session. When strolling along the narrow streets and going up and down the steep steps, a multi language guide will be with you taking about the origins and history of the medieval village and its untouched lanes where no cars are allowed. You’ll be introduced to the many stories of ancient inhabitants, walking within the medieval citadel walls, looking at the old houses and buildings: each of them with its own story, secrets and peculiarities. You’ll be revealed stories about village sieges with inhabitants doing their best to survive them by creating terraced vegetable gardens and hidding water in underground tanks. Before leaving you’ll receive some special gifts and souvenirs: your apron, chef hat and recipes of the dishes you prepared with the help of Paola.